Domestic violence MUST stop. The way for this awful crime to stop starts at the foundation of the community. Zero tolerance. Community attitudes are finally starting to reflect this. 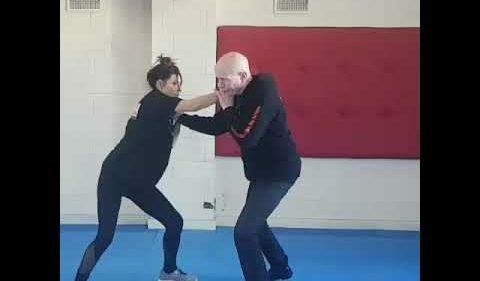 At Billy Manne Martial Arts we regularly conduct Women Only Self Defence Courses. This course is designed by a woman for women. Only a woman understands how it feels to be intimidated by a man and we can provide the tools and conditioning to give you confidence in these horrible situations. Next course starts 24th April 2019. Please call Simone for details 0434266527 Enrolling Now! Because of intimidation, you need both mental and physical conditioning. Step-by-step we will teach women how to gain confidence in difficult situations. We will teach, train and condition your body so you become capable of inflicting damage as quickly as possible. Through repetition you will gain the core strength required to effectively strike and disable an assailant. Not only will the training make you feel more empowered – its a productive way to deal with mental and physical stress. Its a win-win situation . Increased activity and mental direction will assist you with weight loss. Add the fact that Simone Manne is a qualified nutritionist who has helped many girls with weight loss (and weight gain where appropriate) and you have a dynamite combination not normally available at Martial Arts gyms. Billy Manne has over 45 years worth of Martial Arts experience in various disciplines. Simone also has vast experience in Karate and Krav Maga. You have one of the most experienced Martial Arts teachers in the world at your disposal.